Although India is currently suffering at the hands of a depreciating rupee and soaring crude oil prices, yet this has still not managed to impact the wealth creation rate in the country which currently is at an all-time high. The Barclays Hurun Rich list for the year 2018, revealed that there were 831 individuals ranked by their net worth. These individuals have qualified for this most comprehensive rich list, which is aimed at tracking private wealth in India. Average wealth in the list is about Rs 5,900 crore and the average age of these rich people is 60 years. City-wise, the Barclays list says about 233 individuals, which is 28%, are residing in Mumbai. This city is a financial capital and it has created a huge number of India’s top entrepreneurs. Mumbai was joined by New Delhi having 163 individuals, followed by Bengaluru with 70 individuals. With 22 new entrants, Ahmedabad overtook Hyderabad, Chennai and Kolkata and jumped to 4th rank. 59% of the new additions were contributed by the top 3 cities this year. 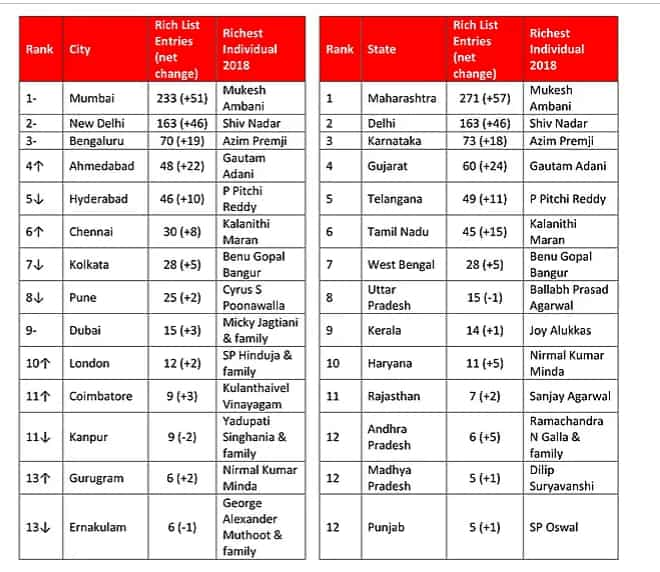 In fact, with 271 and 163 entrants respectively, Maharashtra and Delhi are preferred states of residence for individuals in Barclay’s list. Going ahead, these 831 individuals have a minimum wealth of Rs 1,000 crore which is up by one third or 214 individuals compared to last year. 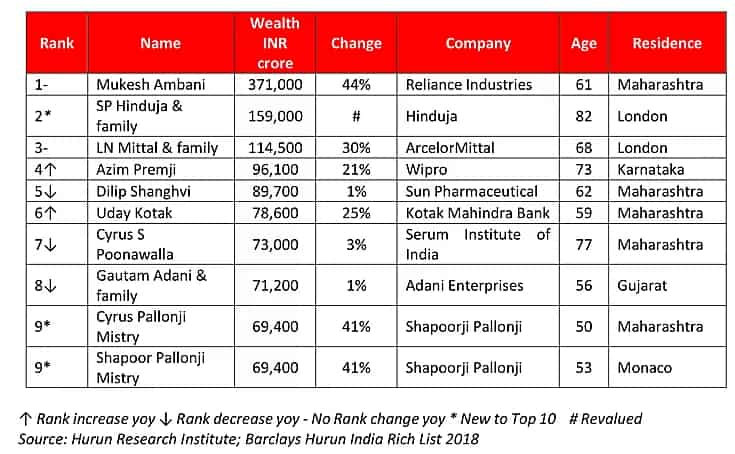 The top ten individuals in the 2018 list of Barclays Hurun witnessed a staggering 10% growth which is Rs 69,400 crore higher than compared to last year. To no surprise, it is Reliance industries chairman who tops the 2018 list with a wealth of Rs 371,000 crore. With this, Ambani has now held the number one rank for seven consecutive year, riding on the back if 47% rise in its flagship RIL share price. In fact, Ambani’s wealth is more than combined wealth of the next three richest people namely Hinduja, Mittal and Premji. Ambani’s wealth increased by Rs 300 crore a day over the past year. The owner of Hinduja Group storms into second place with wealth up to Rs 159,000 crore. Hinduja Group is possibly the biggest privately held conglomerate in India with investments from lubricants to new energy to virtual reality. This year, the Barclays list also valued more than 25 companies that are owned by the brothers. Recently, the group announced interest in buying majority stake in Mauritius based MauBank which has real assets worth Rs 17,000 crore globally. Founder of world’s largest steel manufacturer ArcelorMittal had to be in the list. However, he was at third spot with 30% jump in his wealth since last year on the back of steady growth in the steel sector. Mittal’s flagship company is actively in talks for possible acquisition with Essar Steel who is currently going through insolvency proceedings. They have offered about Rs 42,000 crore for the deal. For now Mittal owns wealth of Rs 114,500 crore. IT-giant Wipro’s chief was on fourth spot by witnessing 21% rise in his wealth. In November 2017, Wipro bought back 7.6% of shares for Rs 11,000 crore. Now a prolific investor, Premji picked up a 6% stake in Future Retail from Bharti Group for Rs 1,700 crore in June 2018. Premji’s wealth stand at Rs 96,100 crore. With wealth of Rs 89,700 crore, Shanghvi was at 5th spot down by 3 ranks from last year. His loss in wealth in Suzlon, whose share value declined by more than 50%, was neutralized by minor gains in Sun Pharma’s share price. Shanghvi bought 3.8% stake in Unichem Laboratories. One of the largest private lender Kotak Mahindra Bank’s leader Uday Kotak bagged sixth spot having wealth of Rs 78,600 crore. Kotak started the business with a small loan from family, and now runs one of this largest bank. Interestingly, Kotak is the only senior executive in a private bank to get a pay rise last year. However, the wealth may be impacted ahead as RBI has directed Kotak to reduce his stake in the bank from 30% to 20% by end of December 2018. Having a wealth of Rs 73,000 crore, Poonawalla is a recipient of Padma Shri for his contribution in medicine. Not only this, Poonawalla has also joined the list of exceptional leaders such as the former US President Barack Obama amongst other renowned public personalities. Standing at 8th spot, Adani has a wealth of Rs 71,200 crore. The Adani Group is a multi-billion-dollar conglomerate with interests in transmission, power, real estate and more. Recently, Adani bought Mumbai-based electricity distribution business from billionaire Anil Ambani’s Reliance Infrastructure for about Rs 18,800 crore. Even after being trapped in controversies and fighting a battle against Ratan Tata’s group, Mistry’s wealth has seen no impact. The ex-CEO of Tata Sons has a wealth of Rs 69,400 crore which was up by 41%. Not this, even brother Shapoor P Mistry held similar wealth and growth. Both the brothers have jumped 3 ranks since last year, on the back of 56% increase in TCS share price which accounts 67% of total Tata Sons market cap. The brothers wealth are derived from Shapoorji Pallonji Group and their holdings in Tata Sons. Following the above, more than 50% of Indian business listed in Barclays list is run by families. 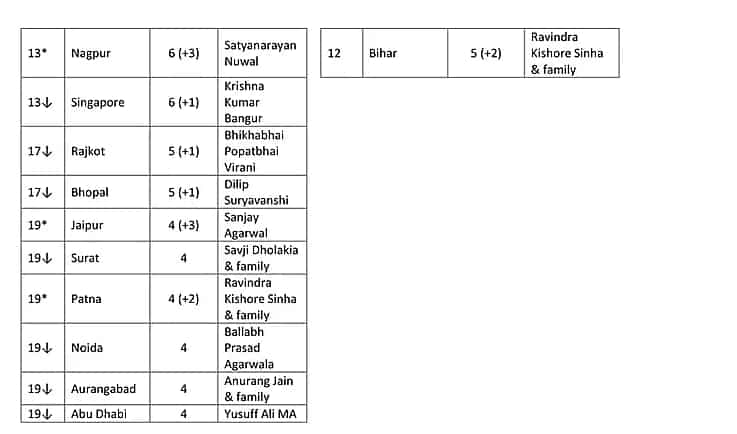 Here’s a list below of top 10 richest Indian families.